With over 30 years of experience, our locksmiths can be trusted to set up your business with the most secure and reliable doors available. For optimal protection it is crucial to have efficient and timely installation. Whether you need doors, keys, locks or related services, we are experts in our industry and provide customers with the highest quality products in the shortest period of time. At Great Valley Lockshop, our goal is to install commercial doors within the parameters given to us by our customers. With efficiency and attention to detail, we provide superior service. Our quality workmanship ensures satisfaction and safety. We work closely with a range of security alarm manufacturers and industry organizations such as the Associated Locksmiths of America (ALOA) & the National Fire Protection Association (NFPA) to guarantee that every door is installed according to federal safety standards. Great Valley Lockshop has three primary objectives when providing products and service to all of our customers. From the moment you call us with a question or to schedule an installation, we work efficiently to deliver all of the information you need. We recognize that building a positive public image and reputation is important to every business owner. Our selection of commercial doors and hardware are not only professional in appearance, but will continue to look good even after extensive use. 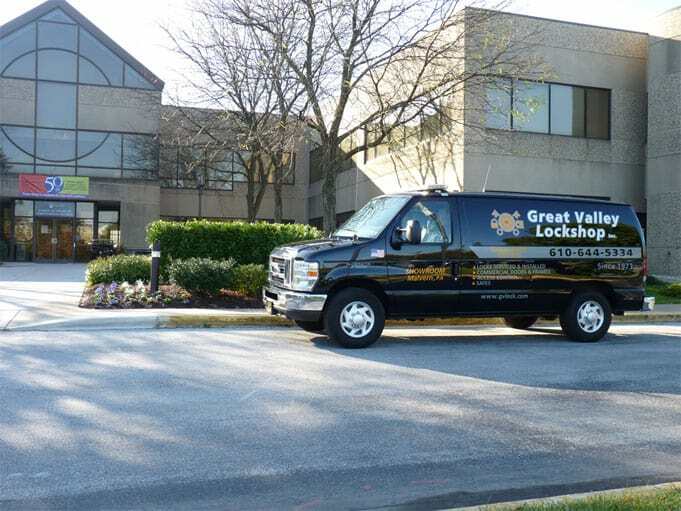 With over 45 years of experience, Great Valley Lockshop is an expert in all things related to locks, doors and keys. Rest assured that your business is protected with the highest level of security.